To get to the next national park on our list, we briefly had to leave the Tasmanian Wilderness. There is no direct route from the national parks in the south to those in the north. So we took the detour via the A10 and stayed at a very nice, free campsite near Ellendale, the Ellendale Bethune Camp Ground. Cradle Mountain—Lake St Clair National Park actually consists of two national parks and therefore has two different entrances, each with a visitor center. The driving distance between these entrances are about 200 km. There is a shortcut though if you fancy to walk the Overland Track. This track connects the two visitor centers, is 65 km long and can be hiked in 6 days. From the beginning of October until the end of May, however, booking is necessary. After we filled up our supplies in a small town called Ouse, we drove to Lake St.Clair National Park in the South. The park is named after the Lake St Clair, which is also the starting point for many hikes. We started with a walk to Platypus Bay, where you can observe platypus in their natural habitat if you are lucky. The first animal we meet is a tiger snake. Warning signs indicate that these are currently very active in the national park. It did not represent any danger for us, because it disappears fast into the bushes. Nevertheless we had to recover a bit from this encounter. Unfortunately, we had no luck with the native animal world at Platypus and went back without seeing a platypus. Afterwards we had a look around the visitor center. Christiane wanted to have a “hike-free” day to take care of some things. I wanted to use this opportunity for a longer hike, which Christiane didn’t want to do anyway. So we asked one of the employees for the weather forecast and checked the adjacent café to see if Christiane could sit there with her laptop. Our camp site for this evening was actually not a camp site. Directly at the entrance to the national park (about 5 km from the visitor center) is the Derwent Bridge Hotel. Camper can use the parking lot free of charge and use the public toilets on the other side of the street. Attached to the hotel is a great restaurant / pub where we ended the day with a delicious beer and vegetarian curry. Although Christiane had her day off, she had to get up with me at 6am, because we had to drive the 5 km to the visitor center. From there I started my hike to Mount Rufus. The hike is a 19 km long circular path, which is estimated to take about 7 hours and has a lot of meters in altitude. But first the path goes from Lake St.Clair through dense forest. Again and again I walked through spider webs, and although you can hardly see them, they stuck quite well. After about 75 minutes I stood at the foot of the mountain and started the ascent. It went steadily uphill and after a short time I could already see the lake behind me. After I had reached the back of the mountain, it went over the back further towards the summit. But first I had to enjoy the panorama. As so often, the summit, that I saw every now and then, turned out not be the summit of Mount Rufus after all. From the “fake summit” it went downhill again and then up to the real summit of Mount Rufus again. Now I could finally see the “summit cross” (which here resembles a beacon). 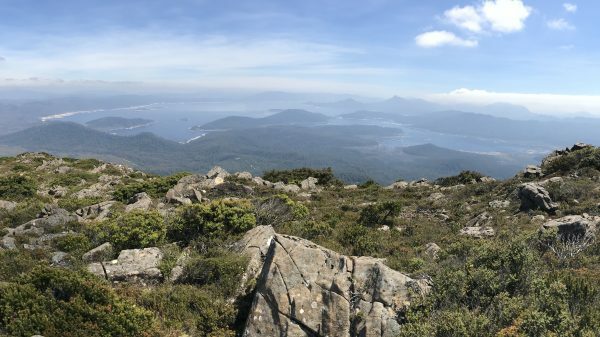 The weather was just perfect for this hike, the view was spectacular and I could see the surrounding mountains very well. After a long break I went down the other side of the crest again. Here the way led several times over a footbridge, which ensures that the sensitive vegetation is not destroyed by hikers. Many lizards were sunbathing. After a while, I arrived at Shadow Lake, took a break and made some pictures. Shortly afterwards I met other hikers for the first time (4.5 hours after my start). Then I walked along the Hugel River for a while. I couldn’t see it, but I could hear it again and again. Meanwhile I got a lot closer to the visitor center, accelerated a bit and finally arrived at the visitor center at half past one. Here I took a free shower that is offered for walkers. Really great that something like this is offered! Afterwards I picked Christiane up at the café and we continued our journey. Cradle Mountain is located in the north of the national park and is very touristic. 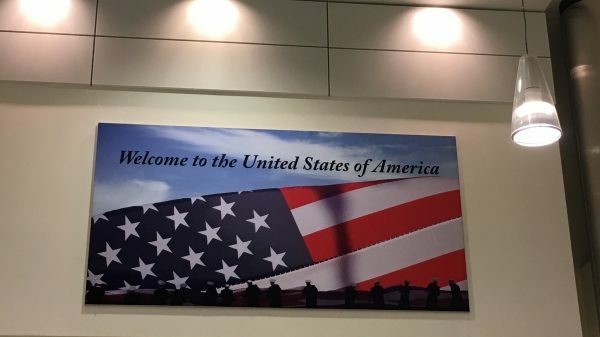 That means there are many hotels, lodges etc. here. The big crowd of visitors has finally lead to the introduction of shuttle busses to get into the national park. Thus, with a camper van you are not allowed to drive much further than to the visitor centre. You can drive with your car into the national park outside the regular shuttle bus driving hours. I assume that is to prevent camper vans and caravans to stay over night in the park and use the facilities. The road towards the parking lots is partly very narrow; so no two cars can pass each other. How the traffic worked here before they introduced the shuttle busses is a mystery to us. So it was probably a good idea for the safety of nature and wildlife to introduce the shuttle bus. However, there was a catch. I was looking forward to do the hike to the Cradle Summit (estimated to take 8 hours), but the first shuttle bus started as recently as 8:15am from the visitor center. This means firstly, that you do your hike with a big group of people, and secondly, when you ascend to the summit, you have to do that in the midday sun. Although you can access the park earlier with a car, this exception does not apply to camper vans. So there is no way for me to do the hike earlier in the morning, so I’d rather not do this hike. I don’t want to go up there in the blazing midday sun! In the national park itself we also use the opportunity to visit a Devils@Cradle, a sanctuary of Tasmanian devils. More about this in Christiane’s upcoming post about will write another blog post about the Tasmanian Wildlife. 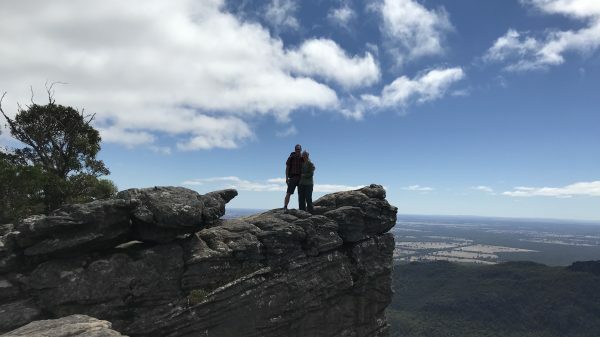 The big crowd of tourists at Cradle Mountain National Park also means that the price for the only camping site in the national park is simply outrageously expensive. We can’t accept to pay almost $50 for a site without electricity (no drinking water and the showers cost extra! ), so we opted for the alternative O’Neills Creek Reserve. This campsite is a good 40 minutes drive from the national park. It offers flush toilets, some picnic areas in the shade and you can even dispose of your garbage here. Every day, the caretaker checks if everything is ok and cleans the sanitary facilities. O’Neills Creek Reserve is located at the foot of Mount Roland (a challenging alternative to Cradle Summit) and costs only $5 per night. We stayed here for 3 nights and it was a great starting point for our activities! On our second day in the Cradle Mountain National Park Christiane suggested to combine two hikes. First we went around Dove Lake. 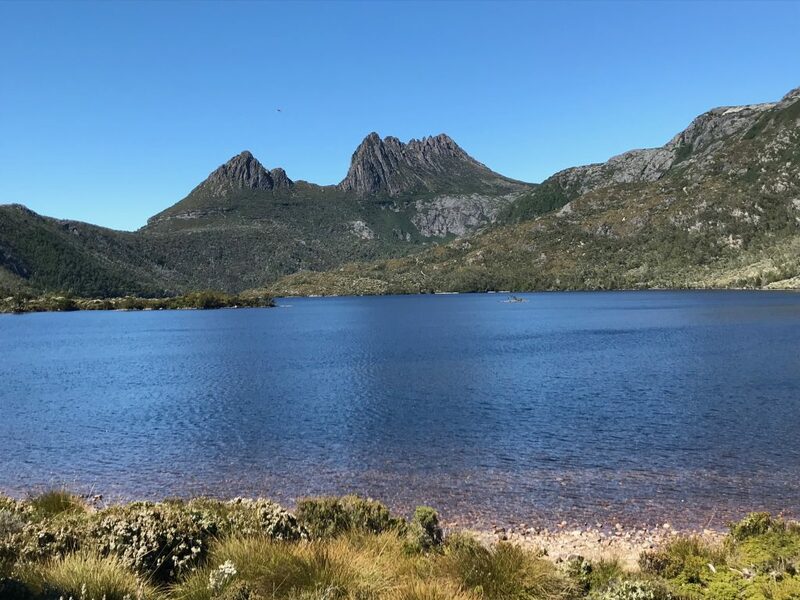 This hike offers a great view of Cradle Mountain and of course of the lake itself. The circular trail is about 6 km long and is indicated with a walking time of 2-3 hours. The weather was great, so we were able to take some nice pictures. Afterwards we went uphill for a while until we finally reached Crater Lake. This round trip is also about 6 km long and should take about 2 hours. From the highest point we had a great view over several lakes (Dove Lake, Lake Lilla and Wombat Pool). We then descended from Crater Lake via Ronny Creek. At Ronny Creek there should be the possibility to see our first wombats, but we had no luck. We guessed that maybe it was too hot or the wrong time of day. In the next national park (Narawntapu) we might have more luck with wildlife. But first we were compensated by another Echidna sighting close to the parking lot ?